VANCOUVER — Copper Mountain Mining has tabled a US$70-million, all-share bid for Australia-based Altona Mining and its district-scale Cloncurry copper-gold property 95 km northeast of Mount Isa in Queensland, Australia. 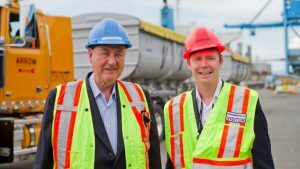 Copper Mountain Mining CEO Jim O’Rourke (left) and CFO Rod Shier during concentrate shipping at the Vancouver Wharf. Credit: Copper Mountain Mining. The company reported on Nov. 19 that it is offering Altona shareholders 0.0974 of a Copper Mountain share, which will be dual listed on the Australian and Toronto Stock Exchanges, for each share held. The offer equates to a 41.7% premium based on closing prices at the time of the deal. Copper Mountain’s flagship asset is the 75%-owned Copper Mountain open-pit mine outside the town of Princeton in southern British Columbia. Japan’s Mitsubishi Materials holds the remaining stake in the operation, and has an off-take agreement entitling it to all the life-of-mine copper concentrate production. Copper Mountain expects to produce between 75 million to 85 million lbs. copper this year. The mine has around 15 years life remaining based on proven and probable reserves of 133 million tonnes grading 0.35% copper, 1.47 grams silver per tonne and 0.12 gram gold per tonne. Altona released an updated feasibility study (FS) on Cloncurry earlier this year, which models a 19,200-tonnes-per-day open pit mine that would produce 86 million lbs. copper and 17,200 oz. gold annually over a 14 year mine life at cash costs of US$1.92 per lb. Altona has earmarked four copper-gold deposits for production, namely: Little Eva, Lady Clayre, Ivy Ann and Bedford. O’Rourke explained that the project has “all major permits,” but will require “some amendments” and additional regulatory work to move into construction. Copper Mountain said it is targeting production by 2020, and would likely fund the US$217 million capital expenditure requirement via debt facilities and treasury. For more information visit www.cumtn.com.